Digging and Dreaming: a review of Alastair McIntosh’s Poacher’s Pilgrimage. I spent a chunk of my twenties living and working on the Isle of Iona, which lies a mile off the south-west tip of the Isle of Mull. Friends from the city couldn’t understand why I chose to move to somewhere so remote, so peripheral. When I returned to the mainland, I understood that it was unlikely I would live anywhere again that felt quite so centred. From Iona you can see past the Treshnish Isles to the islands of Coll and Tiree and, occasionally, on a sharp autumn day, you can see beyond them to the hills of South Uist on the Outer Hebrides. Now that would be remote, I remember thinking, from my island off an island. McIntosh is a writer and activist, known for his work with the GalGael Trust and the Centre for Human Ecology, and for his role in many of Scotland’s key environmental and land-rights campaigns. Poacher’s Pilgrimage is his account of a return to Lewis, pulled back by a desire to revisit his home turf and to make some time and space for contemplation and the settling of his ‘soul’s compass’. It describes a twelve day walk he took from the south of Harris to the north of Lewis, camping most of the way and armed with a collapsible fishing rod in the hope of fulfilling the prefix of the book’s title. Having gained so much from McIntosh’s previous books, I confess that I was wary of Poacher’s Pilgrimage. There’s currently a glut of books about people walking in the landscape, with a whole genre of ‘new nature writing’ that primarily involves people (usually men) walking (usually alone) and then relating their (usually ecstatic) experiences. This isn’t necessarily a bad thing, and I’ve read some brilliant ‘new nature books’; the problem lies in the difficulty with which writers seem able to distill their experience while avoiding over-embellishment. It’s understandable: nature is spectacular and it’s hard to resist the superlatives when trying to capture its beauty or describe your own rapturous encounters with it; but I’ve had my fill of ‘bruised skies’, ‘azure sunsets’ and ‘gibbous moons’, not to mention the need to dramatize every walk until it becomes a feat of superhuman endurance. Happily, I can report that McIntosh avoids the worst excesses of the genre. There are occasional lapses but he’s too good a writer to allow the prose to become overly purple, and even when he does notch up the tension, with a risky river crossing or by exposing himself to the early stages of hypothermia, he leavens the drama with a healthy dose of self-deprecating humour. Indeed, one of the unexpected pleasures of the book is just how laugh-out-loud funny it is, as, for example, when he attempts to free the mass of sphagnum moss that has, for decades, blocked Tobar a’ Ghobha – the Blacksmith’s Well – and ends up soaked to the skin and covered in slime. There’s also a fine gag, running throughout, where the city of Aberdeen becomes synonymous with all the ills and distractions of modernity. Aberdeen! 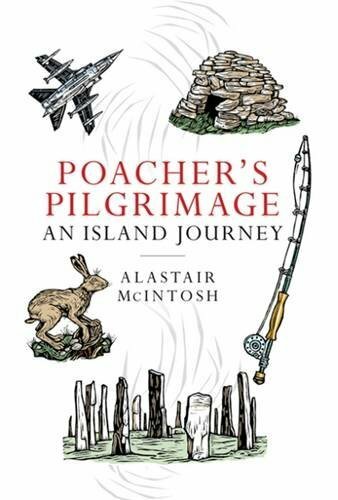 While McIntosh shares both the delight and, at times, drudgery of his 12 day walk, Poacher’s Pilgrimage is more than just a diary: it’s also a guide. The book is rich in culture, switching between personal accounts, tales of historical and contemporary events, place-name orthography and ancient legends; and the accumulative effect is to seduce the reader with an ever more intimate view of the island and its inhabitants. Such lore also confirms the truth of a place that isn’t peripheral at all, that is instead, like Iona, centred, and that has for centuries drawn people to it. Indeed, McIntosh notes the irony that what was once known as ‘the Island of Strangers’ – Innse Gall – is now at the centre of Gaelic language and culture. Layered between the lore and his account of the walk itself, several key themes are explored – at one point he confesses that really his pilgrimage is to do with ‘God, War and the Faeries’ – and it’s in these layers that the deep purpose of the book reveals itself. Alastair McIntosh makes no secret of the spiritual foundation to his work and of the unconventional approach he takes towards orthodoxy. As he acknowledges, he’s often “too pagan for the Christians, too Christian for the pagans.” In Poacher’s Pilgrimage, he grapples with some of the thornier issues inherent in that stance, exploring Augustine’s theory of ‘just war’ and his own pacifism in response to the horrors of conflict and violence. At a more local level, he tries to gain an accommodation between the grace and generosity he experiences amongst Hebridean Presbyterians and some of the harsher strictures of their faith. Along the way, the book gives as straightforward an account of the Westminster Confession and the doctrine of ‘double predestination’ as I’ve read (I haven’t read many) and, though he doesn’t flinch from criticising its logic, McIntosh does honour the guidance and succour that “rocky old Calvinism” has provided to those generations brought up in the Faith. He also, of course, gives the faeries their due. Drawing on studies by scholars such as Ronald Black and John MacInnes of the School of Scottish Studies, as well as older accounts by writers such as John G Campbell of Tiree and Kenneth Macleod of Eigg, McIntosh argues convincingly that Scottish faerie lore – Sithichean in Gaelic – instead of being dismissed as childish fantasy, should be considered an invaluable part of our ‘ecology of the imagination’; and that such traditional cosmologies act as a necessary corrective: the Mythos to balance our Logos. Occasionally, the book can be overwhelming. It’s a peregrination rather than a linear route-march and there’s just so much going on: one moment we’re visiting a Sithean, or fairy hill, the next addressing NATO commanders in Switzerland, the next, witnessing both the violence and the redemption of street boys in Papua New Guinea, before returning to the island to view the sky through the slatted stone roof of a thousand-year-old beehive hut or bothan. Thankfully, McIntosh is a skilful, if eccentric, navigator, and he steers such an entertaining and thought-provoking course, that I was more than happy to sit back and enjoy the ride. In many ways, McIntosh reminds me of that other island exile, Edwin Muir, whose own childhood on Orkney had a similar impact on his work. The two writers are very different in style, but they share a fascination with the archetypal and the spiritual, and they both attempt to dig deep, to slip beneath the psychic skin of their respective islands. In doing so, Poacher’s Pilgrimage affirms the value of grounding a life in something more meaningful than simple materialism or reductive rationalism. A key passage in the book describes the eye shields that Inuit hunters make from the shoulder blades of reindeer. A slit is cut in each bone and they’re worn like goggles – the reduced vision averts exposure to the glare of winter snow and protects the wearer from snow-blindness. This is a useful tool in the Arctic, but McIntosh uses such goggles as an analogy for our own tendency to limit our vision, to see only what we want to see. His plea: to widen the slits, to expand our consciousness and our understanding of what it means to be human and alive at a time when so many of our previous, taken-for-granted narratives are unraveling. Alastair McIntosh is a compelling writer because he has succeeded in widening the slits in his own goggles (if not, at times, thrown them away entirely!) and because he embodies the possibility that you can embrace such an expanded vision and live a life rooted in service and practical achievable goals. That’s his aspiration as an activist and that’s the message of this wonderful book. Max well, That the Glensanda quarry causes “so little environmental damage other than the visual” is a curious way to describe the removal of the environment itself! The jobs that can be generated by communities themselves once they have control of their lands and futures are surely incomparably sustainable compared to jobs generated by allowing corporations to remove the environment itself – a process which, by definition, cannot last. Thanks Justine. Firstly for transparency sake I used to , thirty years ago work at Glensanda as a boatman, labourer and cook and secondly I have more recently been attempting to sell them wind turbines to run their grinders so I have my agenda. When John Yeoman started the quarry ( I was his second employee and knew him well ) he told me that tourism and fishing would never create a situation where local people could buy land as it was almost impossible to get a mortgage from those seasonal trades. In the forty years I have been watching the local economy I have seen virtually every attempt at revitalising the economy fail. I accept that there is some visual intrusion but not much and every time I sail past the place I go and view it with delight. I have no idea how many local people work there in their workforce of around 150 but I do know that when I was there our instruction was to give every local who applied twice at the very least an interview. I also know that the claims made about marine pollution haven’t transpired ( I have dived off the pier and seen the quality of the sensitive marine life ) When John Yeoman was alive his figures were that he could put a tonne of granite into London for 90p without it ever going on a lorry and he claimed that Glensanda would obviate the need for one hundred and fifty quarries that were being served by lorries. Not convinced? I have a friend who has a bothy there and if ever want to walk in and make your own evaluation I would be happy to accompany you. The road past the quarry has public access. Its a six mile hike over the hill. If we dont see deer I’ll buy you a bottle of talisker.